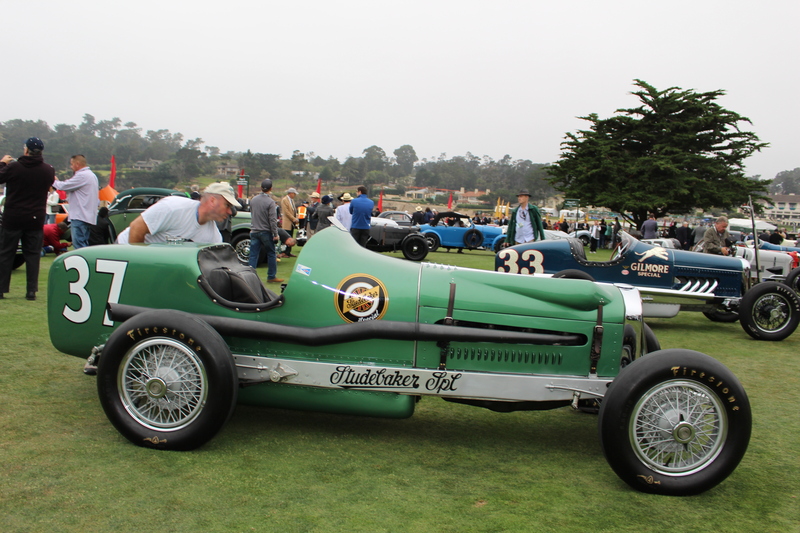 Founded in 1919 by Samuel Morse Pebble Beach Golf Linksbecame the venue for a show of elegance in 1950 as a sideshow to the famous Pebble Beach Road Races. 2016 sees a change in this with the Monterey historic races seen by some as a sideshow to Pebble Beach! Been a lover of both aspects of the motoring movement I put both events on an even par. 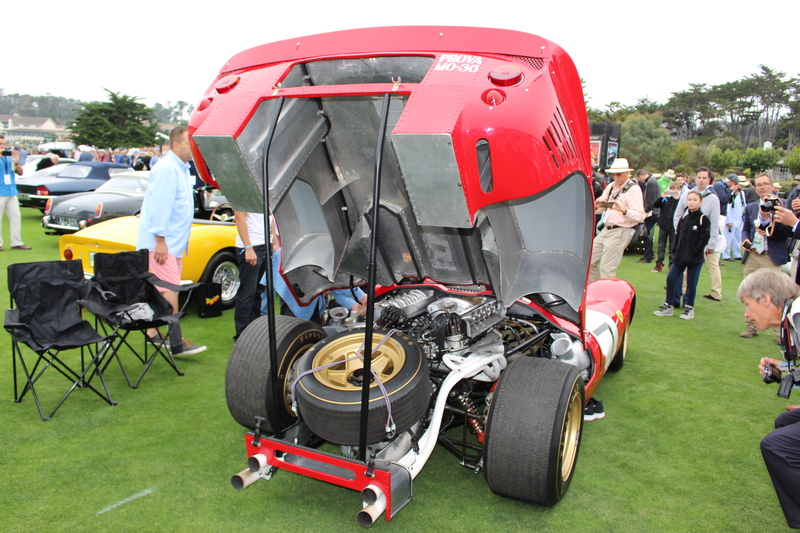 At Leguna Seca you see these fine automobiles put through their paces at speed whilst at Pebble Beach you see them driven on the Thursday in the Tour d’Elegance, then displayed in their absolute pristine condition on the 18th fairway of the Pebble Beach golf course come Sunday. It really is a magical time of the year to visit the Monterey Peninsula on the Californian coastline. It’s Wednesday morning early and time for a run yes, some would say that’s crazy, but it was my view at this event it was the best way I could get to get my head around the geography of the area. Starting at my accommodation at Carmel-by-the-Sea the journey to The Lodge at Pebble Beach is calculated at 2.5 miles. I was soon on 17-Mile Drive where I passed house (estate) after house of manicured gardens, perfectly clipped hedges – it’s almost makes for a contested show in itself. This continued through the guts of the golf course, through the Lodge car park and on to the lawn in front of the Clubrooms. What a sight, to see this venue in its normal state – before the 200 vehicles and 15,000 spectators would descend on it come Sunday morning. As happens when you’re navigating an area for the first time, I got lost so probably ran about one mile further then I had to after the visit to the Lodge, going the wrong way and continuing around the coastline instead of right and up – to find the Equestrian Centre and the Gooding & Co auction house marquee. So we fast forward then to Friday evening where a press conference was held on Peter Hay Hill with Derek Hill the MC and Sandra Button welcoming the press to the event. Sandra went on to note that the entrance fee at the first event back in 1950 was $1.00, and that way back then charity was a big focus of the event. This year’s event raising some $2,000,000 to local charities. Hill then discussed the works of Henri Chapron and introduced his daughter and Noele and grand-daughter Anique. Hill then introduced Ken Sparkes, Head of US Corporate Relations of BMW Group North America. Sparkes introduced two BMW 507s that were positioned on the lawn next to us. One a Coupe and the other a Roadster. The Roadster it turns out has famous links with the car’s first owner none other than Elvis Presley. Elvis bought the car in 1958 whilst enlisted in the Army in Germany and used it as his daily driver. The car (along with the Coupe) were found through an extensive bit of research by Jackie Jouret (Editor of Bimmer Magazine). The atmosphere around Carmel Saturday night was electric with the whole town buzzing with people and cars. There was little chance of getting a seat at any restaurant, wine tasting lounge or bar, but I found a fabulous and quiet restaurant just off Ocean Avenue called The Forge. With its outdoor open fire roaring it turned out to be the perfect choice for dinner. The service, food and drink was excellent and fuelled me appropriately for the hectic day ahead. Whilst access to Concours Sunday officially commences with the opening of the gates to the public at 10:00am for of us who had a blue wristband access was available extremely early. So I arrived just after 6:00am as the sun was rising (albeit shaded by a thick layer of low midst. Clearly a lot of other people had the same idea as there were at least a few hundred people already there. Who would’ve thought an event as prestigious as this would have its own shanty town right adjacent to the presentation ramp – yes, it’s like MCC (Melbourne Cricket Club) members queueing up for entry to the Grand Final and those coveted few remaining seats. Here it’s the picnic set. Picnic rugs, fold-up chairs and card tables set up for the perfect viewing spot for the presentation ceremony at 2:00pm. With the event infrastructure long set up this is the time the show comes together. The arrival and positioning of the 200 entered vehicles. The US has a vast depth of the best cars in the World with many entries coming from various towns across California. Then there’s the overseas entrants – from Hong Kong, Germany, UK, Switzerland, etc. The features for 2016; BMW Centenary, Ford’s win at Le Mans in 1966, Lamborghini Muira’s 50th, the Bizzarini 50th, a special display of pre-WWII two-seat Indycars and a celebration of the works of the famous coachbuilder, Chapron. So where do we start with this mouth-watering selection. Henri Chapron has won me over. His eye and attention to detail with the Hispano-Suiza and Delahaye in particular is quite incredible. 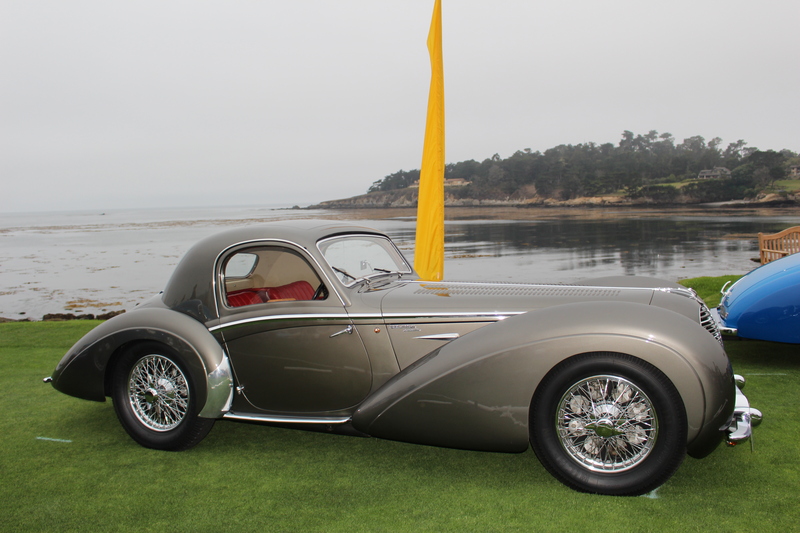 To manufacture a body of those styles today would not be financially achievable on the open market, although perhaps it would as Delahaye was very choosy with his customers at the time. We start our top-10 pick of cars with one of the Indycars, this 1931 Studebaker & Rigling Hunt Special. 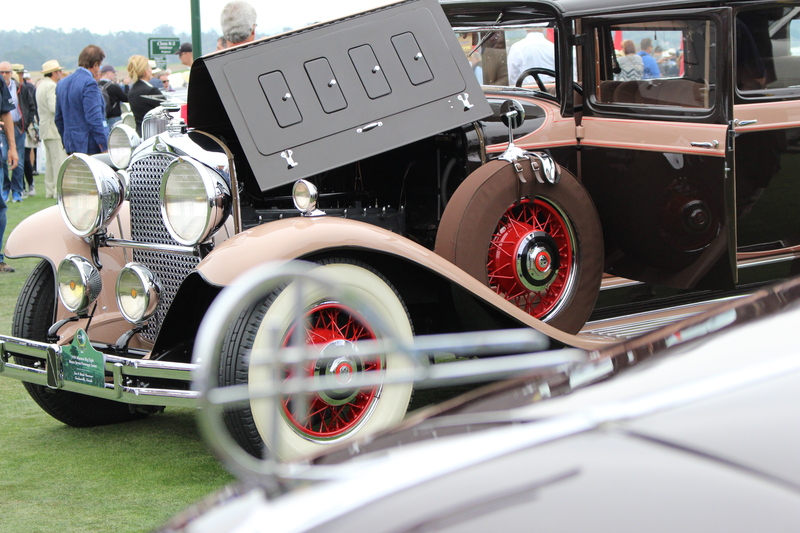 It was built under the direction of George Hunt, Studebaker’s top engineer. The car’s owner was Ab Jenkins, who hoped to drive the car in the 1931 Indianapolis 500, but despite his many speed records he was unable to qualify, so Tony Gulotta drove it, with Carl Riscigno as riding mechanic. Gulotta started well and by lap 120 he was running in 2nd place and was given the go-ahead to run flat out. But as he took the lead, he hit oil from a previous accident and crashed. After the car was repaired it went on to win the 1931 Pikes Peak Hillclimb driven by Chuck Myers. It then returned to Indianapolis in 1932 and was driven by Zak Meyer to 6th place and it returned yet again in 1933 and was driven by L. L. Corun to 12th. Above photo: The 1931 Studebaker & Rigling Hunt Special of Robert & Alice Valpey of New Hampshire. Above photo: The 1956 Ferrari 290 MM Scaglietti Spyder now owned by Les Wexner of Ohio. The show honoured Ford’s achievements at the Le Mans 24 Hour race with 18 of the most historic Ford GT40s on the 18th fairway. In the forefront of the below photo is MkIV (chassis J-6) that was driven by Bruce McLaren and Mark Donahue to 4th place at the 24 Hours of Le Mans in 1967. After Dan Gurney and A. J. Foyt’s historic victory that year in its twin (yes, that’s the red one two cars down! ), all the other J-cars were returned to Shelby American to be fitted with a bubble roof and painted red and were paraded around the United States on various publicity tours. This J-car was acquired by Foyt in 1972. In 1990, after it had passed through several other hands its current owner bought the car and returned it to its proper yellow paintwork as it was seen at Le Mans, its only race. 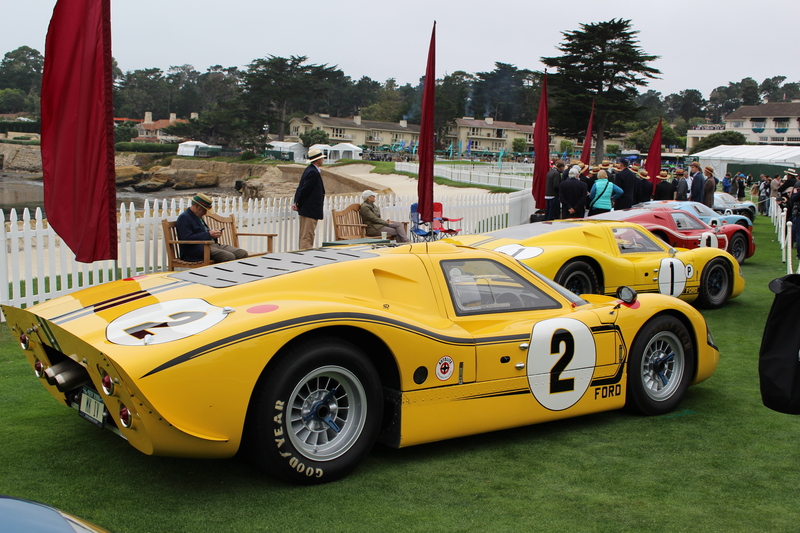 The other yellow Mk IV in the photo (#2) is chassis no. J-4. This car debuted at Sebring in 1967 where it led from the start and took victory with Bruce McLaren and Mario Andretti behind the wheel. Above photo: Three 1967 Ford GT40 Mk IVs, among the 18 GTO40s on the 18th. 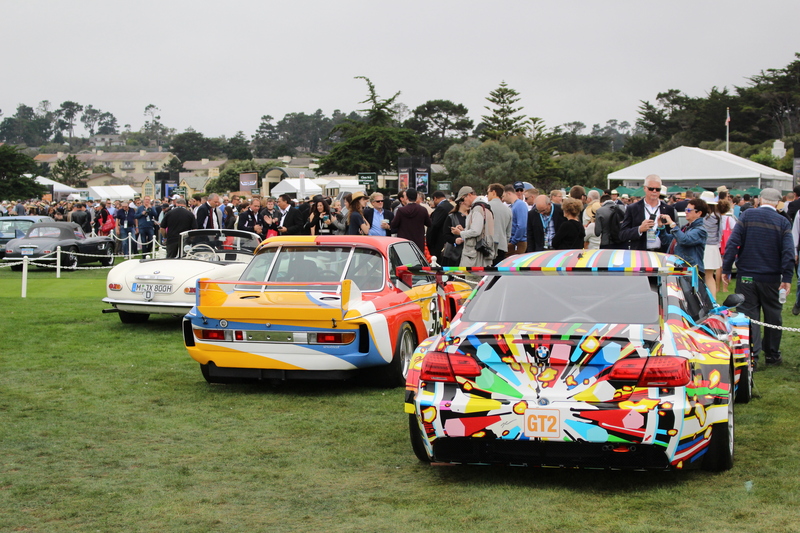 Marking BMW Group’s Centenary, the company displayed three significant cars from its collection on the 18th fairway at Pebble Beach – the Elvis Presley 507 (discussed earlier), and two of its famous ‘Art Cars’. Created in 1975, it was one of the last works produced by American artist Alexander Calder before his death. A sculptor normally accustomed to producing shapes of his own, Calder brought his own, inimitable character to the stunning shape of the BMW CSL. As with his sculptures and mobiles, he used powerful colours and attractive curving expanses, which he applied generously to the fenders, hood and roof. The Alexander Calder Art Car made its first and only race appearance at the 24 Hours of Le Mans in 1975, driven by Sebring 12 hour -inner Sam Posey and two French drivers, Jean Guichet and the team’s owner, Herve Poulain. The 3.0 CSL drove for 9 hours, well into the night, before retiring. Keeping the Calder Art Car company in the below photo is the 2010 BMW M3 GT2, the last BMW Art Car. Aesthetically reworked by the American artist, Jeff Koons, it made its world premiere on 2nd June, 2010 at the Centre Pompidou in Paris. It went on to compete at Le Mans 10 days later. The car was driven by Andy Priaulx, Dirk Muller and Dirk Werne, and it wore the number 79, paying tribute to Andy Warhel’s BMW Art Car from 1979. Although it retired after just five hours of racing, the striking colours and design used by Koons exude a boisterous sense of power, motion and energy. Above photo: L-R – Looking back at the BMW 507, BMW 3.0 CSL & BMW M3 GT2. Chassis 063, this Porsche 356 is one of four cars prepared for the 24 Hours of Le Mans in 1951.Sadly, three of these crashed in testing, so this is the only car that started. The Porsche finished 20th overall, but 1st in the 1,100 cc class, recording Porsche’s first win in an international race and the start of a long-running association with international endurance racing. Following Le Mans the factory entered the Coupe in the Liege-Rome-Liege race and the Montlhery Speed Trials. It was thenexported to Max Hoffman in New York City and sold to Jon von Newmann, who campaigned the car in West Coast SCCA events, including the 1952 races at Pebble Beach. Chuck Forge later raced the car from 1952 to 2009. 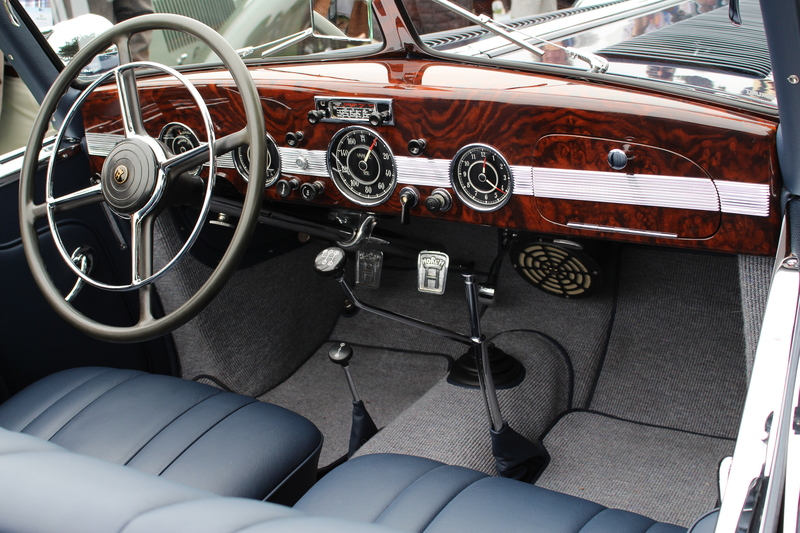 The Coupe has now been restored to its 1951 Le Mans specification. 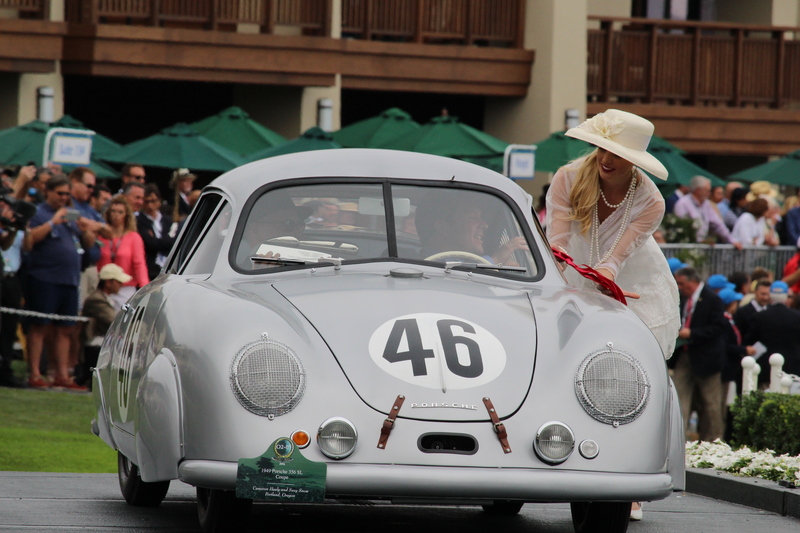 Above photo: The 1949 Porsche 356 SL Copue of Camron Haly & Suzy Snow of Oregon. The below 1938 Delahaye (chassis 60112) is equipped with a desirable racing specification 160 bhp MS engine and coachwork by Figoni & Falaschi. The car was first displayed by the coachbuilders on their stand at the 1938 Paris Auto Salon. Its first owner is not known but it was kept safely hidden in occupied France; it was not discovered until 1968 in a field near Toulon, located in the southern part of the country, on the Mediterranean Sea. Following a meticulous restoration between 1986 and 1987, the car was acquired by the Rosso Bianco Collection in Archaffenburg, Germany where it remained until 2006, when it was purchased by the American collector John O’Quinn.he commissioned a further restoration by Atelier Automobile Anciennes Dominique Tessier with the help of Claude Figoni. 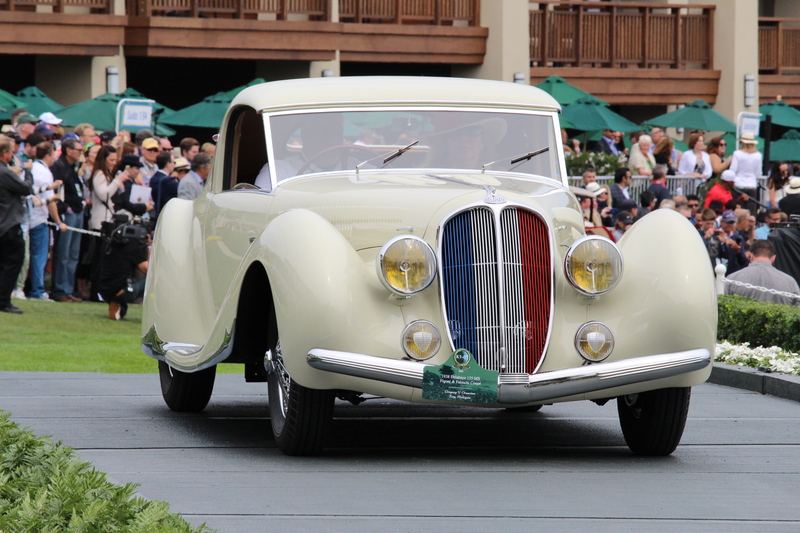 Above photo: The 1938 Delahaye 135 MS Figoni & Falaschi Coupe. The Nordyke & Marmon Company of Indianapolis, soon to be renamed the Marmon Motor Car Company, produced its first experimental cars in 1902. The Marmon Big Eight was introduced in November 1930, a year before the company’s famous 16-cylinder car, and both cars remained in production until the company closed its doors in 1933. Howard C. Marmon was a mechanical genius and the Marmon marque was known as one of the best riding and best performing luxury cars of that era. Five different Big Eight models appeared in the Marmon catalogue in 1930, including this seven passenger sedan. This 1930 Marmon is one of four known to survive with this coachwork designed by Count Alexis de Sakhnoffsky and built by the Hayes Body Company. Above photo: The 1930 Marmon Big Eight Hayes Seven Passenger Sedan of Sue & Butch Marcione, Nevada. This Ferrari 330 P4 (chassis 0856) is the only original example of the three P4s built for the 1967 race season. The aerodynamic, mid-engined racer was designed and built by Pierre Drogo and was further updated by Ferrari before every race it entered. The P4s 450 bhp V12 engine was modelled on Ferrari’s Grand Prix-winning unit, with Lucas fuel injection in place of carburettors. In its first race at the 24 Hours of Daytona in February 1967, Ferrari stunned the racing world when this car crossed the finish line in 2nd place, alongside the other two P4s in 1st and 3rd for a photo finish to mirror the legendary moment when the three Ford GT40s won Le Mans in 1966. The car continued its success that year, winning the 1000 km race at Monza driven by Lorenzo Bandini and Chris Amon, and finishing 3rd at Le Mans driven by Willy Mairesse and Jean Blaston. Its last international race for the Ferrari was the Brands Hatch BOAC 500 Mile that July after it been converted to the open-roof configuration it has today. Above photo: The 1966 Ferrari 330 P4 Drogo Spyder, now owned by Lawrence Stroll of New York. Below is one of only three surviving examples of the first series of the stylish Horch 853. In early 1935, the Horch company began to construct a luxurious sporting car along the lines of the special roadsters being offered by Mercedes-Benz in the 1930s. it’s stunning and immensely detailed in its craftsmanship. Above photo: The 1938 Horch 853 Erdmann & Rossi Special Roadster owned by the Keller Collection at the Pyramids, California. And finally, we gaze over a stunning design by the coachbuilder, Henri Chapron. This is one of four cars built for the Ecurie Bleue racing team that was owned by Lucy Schell and competed in 1938 & 1939. It is built on a Type 145 racing chassis with a Type 165 4.5-litre V12 engine developing 184 bhp, and a four-speed manual transmission with four-wheel mechanically operated ventilated drum brakes. After several races and just before the war broke out, the Ecurie Bleue team decided to sell the car, and it was one of two Type 145s bought by Henri Chapron in order to create his own grand touring coupes. His work was interrupted by the war but when the coachwork was completed in 1947 the car was bought by a M. Vanoucque. William Proctor of Proctor & Gamble Company was its next owner in 1951, and he brought the car to the United States. Peter Mullin added this car to his collection in 2004. 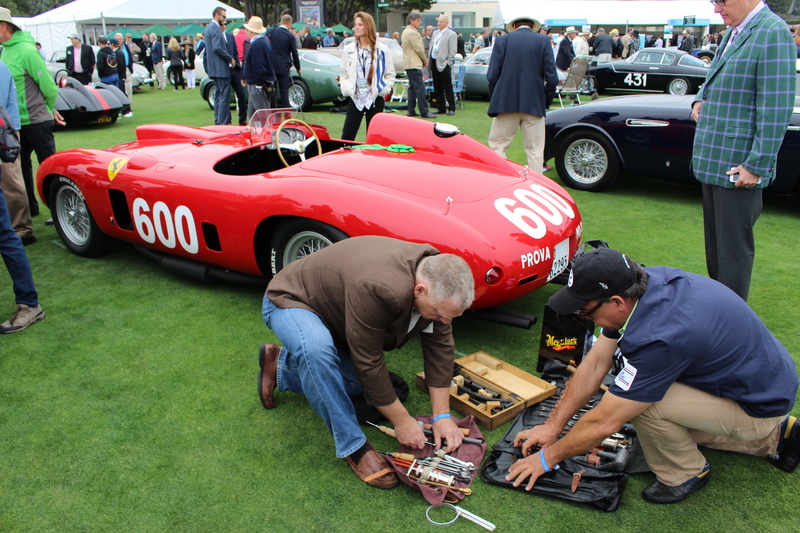 Our experience at the 2016 Pebble Beach Concours d’Elegance was very memorable with far more stories to tell and photos to share. Speaking of photos – check out the Photo Galleries section for more photos. 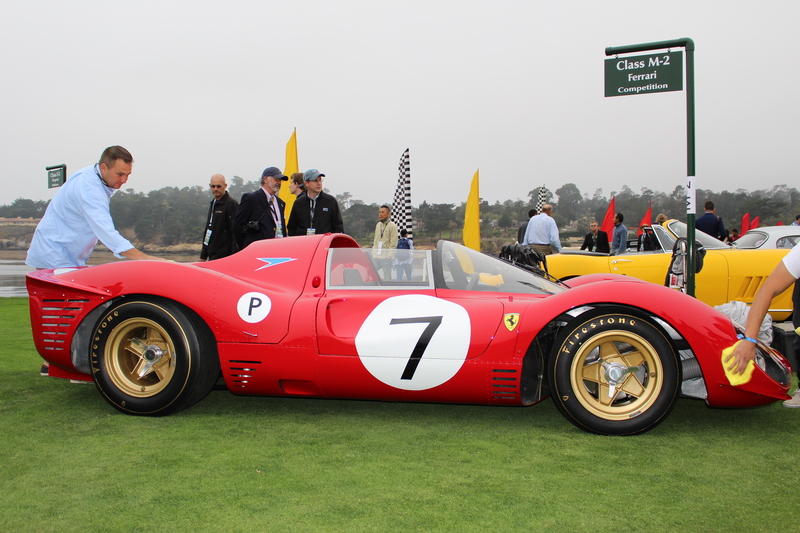 Sources: Pebble Beach Concours d’Elegance Car Guide.